High power, a discreet understatement, ample features and a high degree of everyday practicality – all of these strengths come together in the Audi S models. 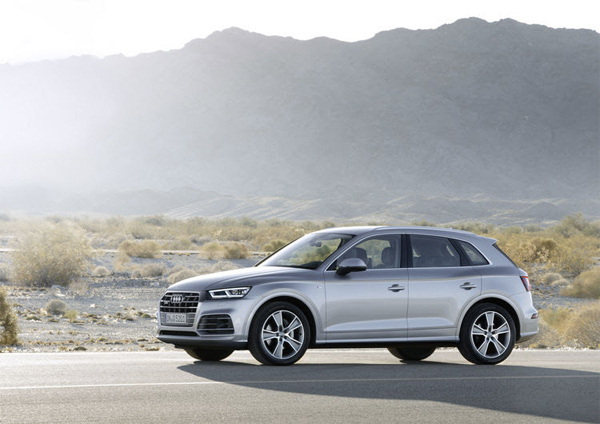 Each model applies its power to the road with quattro permanent all-wheel drive. In the Audi S3 Sedan, the 2.0 TFSI produces 213 kW (290 hp) and in combination with S tronic, torque increases to 380 Nm (280.3 lb-ft) between 1,800 and 5,100 rpm. The Audi development engineers further improved the steering characteristic and exhaust system management, making the Audi S3 Sedan very dynamic. 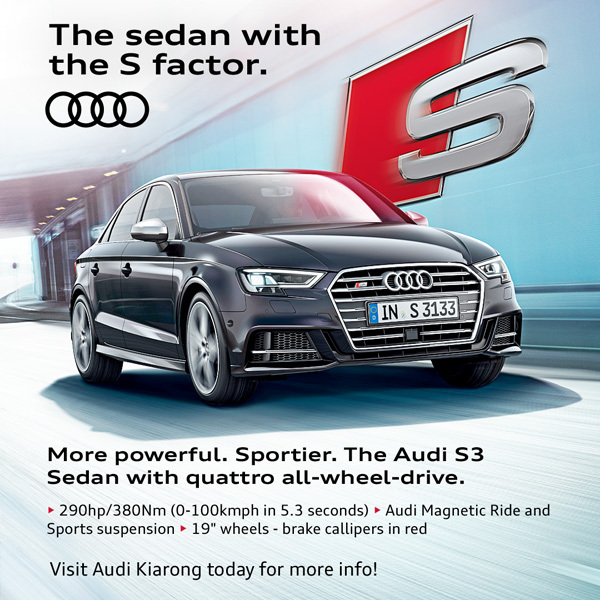 Equipped with the seven-speed S tronic which comes with a freewheeling function, the sprint from 0 to 100 km/h (62.1 mph) takes just 5.3 seconds in the Audi S3 Sedan. The models’ top speed is electronically limited to 250 km/h (155.3 mph). The firmer S sport suspension lowers the vehicle body by 25 millimetres (1.0 in). 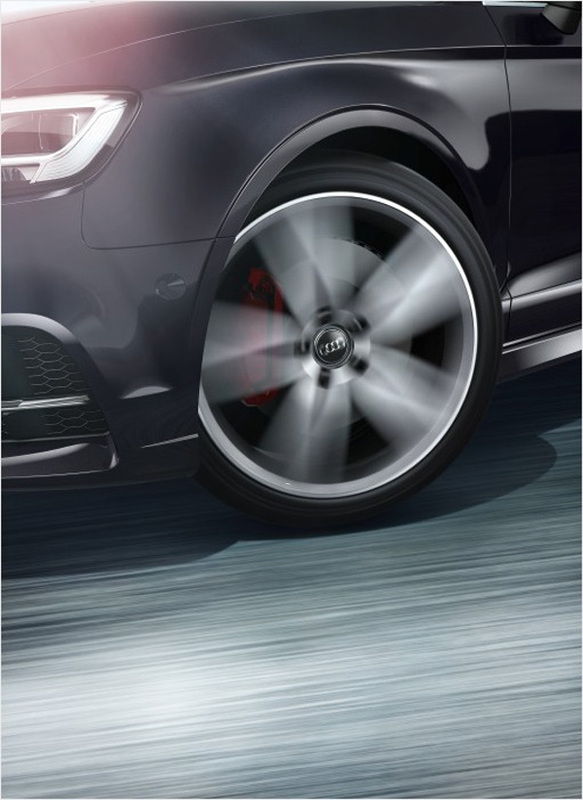 Large brakes operate behind the 18-inch wheels with their S-specific design; the brake callipers are painted red (or optionally black) and adorned by S logos. The ESC electronic stabilization control acts with particular sensitivity. The electrically assisted progressive steering varies the steering ratio – it is somewhat more indirect in the center position, but increasingly more direct as the steering wheel is turned. The Audi drive select dynamic handling system is standard, with Audi magnetic ride suspension available for Brunei standard. 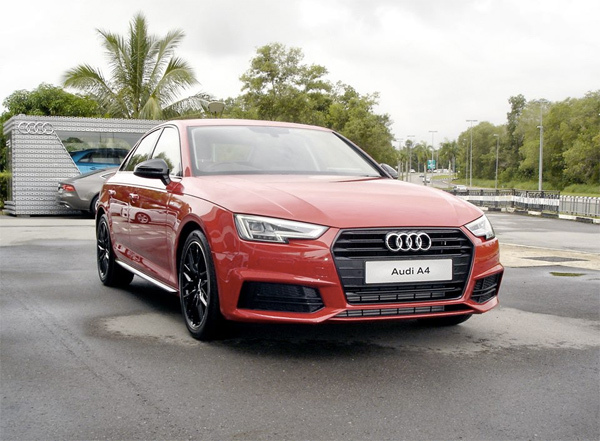 The Audi S3 Sedan is currently the top model in the A3 range from TCY Motors, other variants include the entry level A3 Sportback and A3 Sedan, all available for viewing and test drive at Audi Kiarong showroom. Pg Saiful and Hj Amir who played in last year’s Mexico World Final. 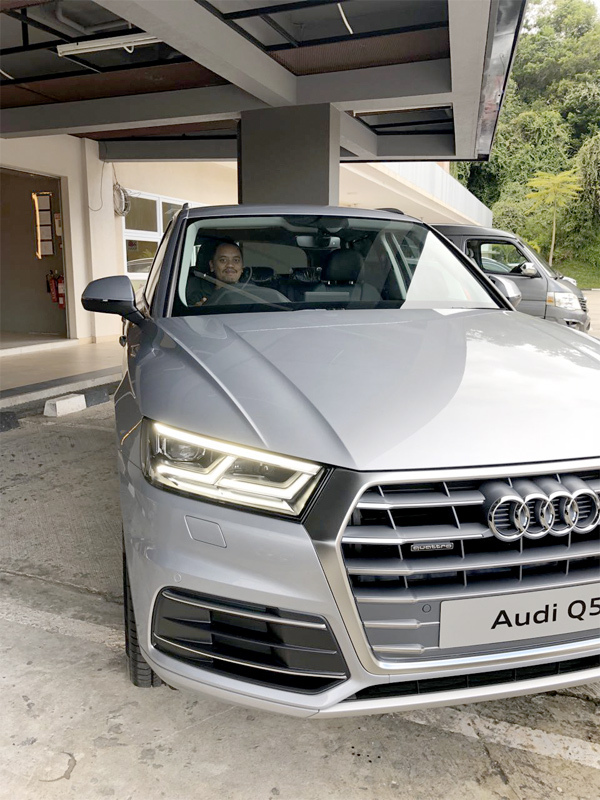 Who will represent Brunei this year in Austria?TCY Motors Sdn Bhd as importer/dealer of the Audi brand will once again hold its annual amateur team-golf tournament this year in July. 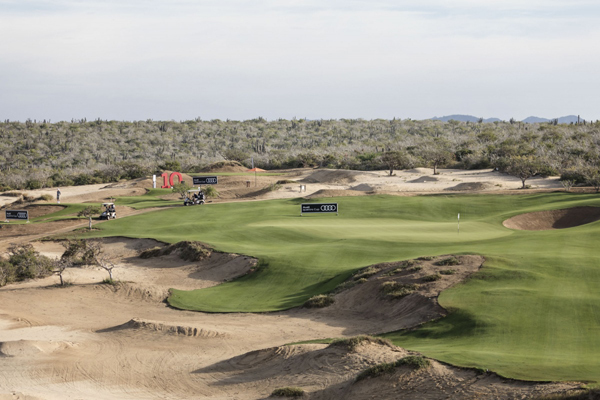 Unlike most local tournaments the top prize is an unforgettable golfing trip to the Audi quattro Cup World Final – every year held at a different prestigious international golf club. This year the venue will be the Golf Club Schwarzsee in Kitzbühel, Austria. Also for this year’s local tournament a new rule will allow any golfer team of any nationality with a valid passport to qualify for the World Final. 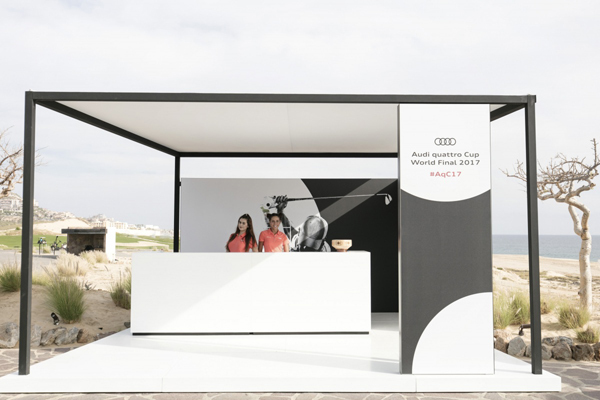 47 countries each year with 700 tournaments participate in the Audi quattro Cup featuring a 2-golfer team format playing under the Stableford system or ‘best ball’. Interested golfers may inquire more at Audi Kiarong during opening hours. 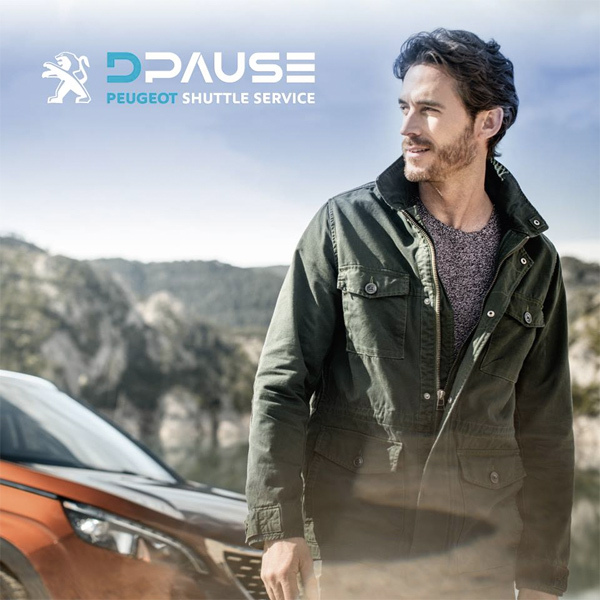 Be treated like superstar with our Pick up and Drop off DPAUSE Peugeot Shuttle Service. Every time you want to service your Peugeot car in our Service Centre, you can enjoy a VIP ride back in our International Awardee New Peugeot 3008 along with a Peugeot driver. Ask your respective Peugeot Sales Consultant or call Kiarong Showroom 242-6868 Service Centre 239-5101 to 02 for more details. T&C Applies. New record-breaking figure for the Four Rings: Audi concluded its best first quarter in the company’s history. Between January and March the company sold around 463,800 automobiles worldwide, 9.8 percent more than in the same quarter last year. In particular, the high demand in China (+41.9%) and North America (+10.2%) drove growth in the first three months. In Europe, however, sales since January came in below the record-breaking level from 2017, down 4.7 percent. In March, the company delivered around 183,750 premium automobiles (+6.0%) worldwide. “The record-breaking start to the year provides us with important momentum. With the Audi A7, A6, A1 and Q3 models, we will be renewing around a quarter of our sales in Europe alone throughout the year,” says Bram Schot, Board Member for Sales and Marketing at AUDI AG. In China, Audi also closed the first quarter successfully. Here the company delivered 154,270 cars since January, an increase of 41.9 percent. In the past month, demand increased by 30.6 percent; the Ingolstadt-based automaker sold more automobiles in China than ever before in the month of March, delivering 54,031 units. The Audi A4 proved an important growth engine. The number of deliveries of the midsize model increased by 86.4 percent year-on-year to more than 13,800 cars. Since the start of the year more than 37,350 Chinese customers received their keys for an Audi A4 (+99.2%). The top seller is following this positive trend worldwide too, achieving growth of 15.3 percent to around 87,850 A4 models delivered in the period January through March. With sales down 5.8 percent in March, Europe is indicative of the complex ramp-up and discontinuation situation of the current model initiative. In Germany and the UK, Audi’s two largest European markets, deliveries were down on the very strong sales figures from 2017. In the domestic market, the premium brand delivered 28,247 automobiles (-9.0%) in March, which had less selling day than last year. In the UK, sales fell 2.9 percent year-on-year in the past month. In the first quarter, UK sales were on a par with the prior-year level, up 0.1 percent, and performed far more resiliently than the declining overall market. Demand in Spain (+11.3%) andItaly (+2.8%) also remained positive in the past month. In both markets, customer interest in the Audi Q5 held up since the start of the year. 1,618 Spanish customers (+51.5%) and 2,106 Italian buyers (+131.9%) opted for the SUV in the first quarter. Another positive result: In Austria Audi accomplished premium market leadership regarding car registrations between January and March. On the North American continent, Audi also continued to grow in March, increasing sales by 8.3 percent to around 24,550 cars. With around 61,400 deliveries, the company posted growth of 10.2 percent year-on-year in the region since January. In Canada alone, Audi sold 3,404 units in March, continuing its double-digit sales growth of the past few months (+14.0%). Since January, around one in three Canadian Audi customers chose an Audi Q5. Audi of America achieved another record-breaking month, with sales up 7.4 percent to 20,090 units. The Q family once again contributed largely to this success. The SUV share in the United States is currently 52 percent, i.e. 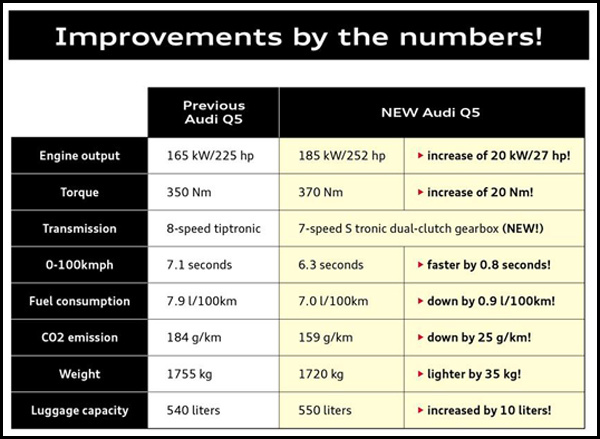 one out of every two Audi models sold in this market is a Q model. The Audi Q7 is proving popular. In the past month, one out of every three Audi Q7 models delivered went to an American customer. Across all models, cumulative sales are up 9.7 percent in the United States. 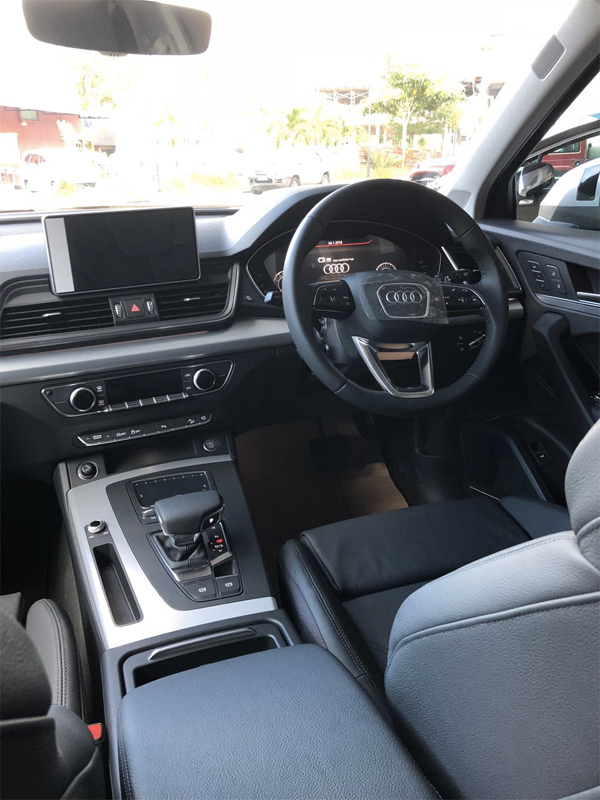 The new Audi Q5 boast many improvements- a stronger Q design identity, better driving experience with new quattro technology coupled with a new 7-speed dual clutch gearbox and maximum everyday usability. A quieter car thanks to improved aero-acoustics and best in-class drag co efficiency (0.30). Standard for Brunei will be 19” wheels. The test drive was pretty successful and many of them praised the handling and the features available on the Audi Q5. They even compared it with other brands and impressed with the quality and it’s also price competitively in the market. 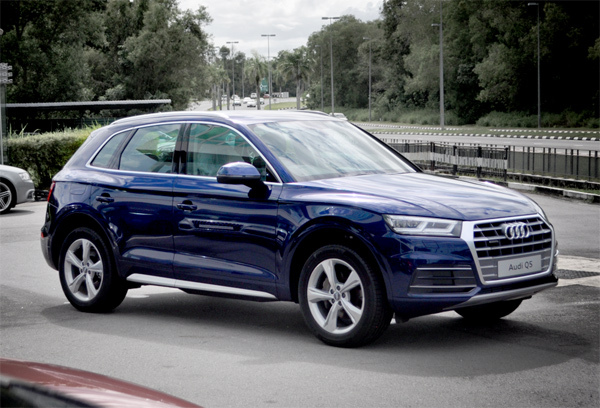 Have you actually test driven the Audi Q5? Do visit their showroom at Kiarong and give the Q5 a run. You’ll be impressed. 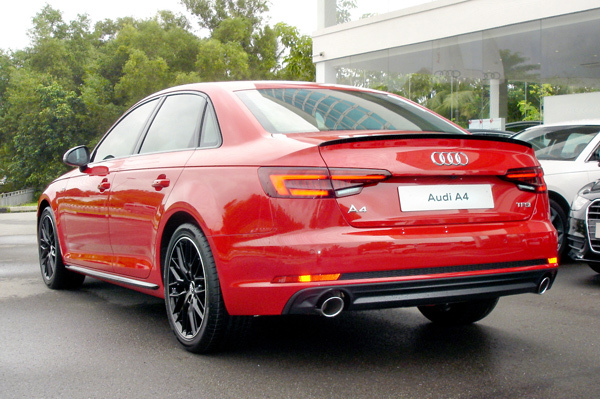 TCY Motors Sdn Bhd has introduced a new variant from its Audi A4 sedan line. The Audi A4 S line Black Styling features the Audi A4 2.0 TFSI Ultra (190hp/320Nm) with all it’s exterior highlights in gloss black in place of the standard aluminium/chrome. this includes the S line rear diffuser, tailgate spoiler and side skirts. An exclusive 18″ 10-Y spoke in matching black gloss wheels rounds off the entire package. Also new on this variant are built-in rear passenger window blinds which were previously not available. The S line Black Styling will also be available soon for the more powerful A4 with quattro AWD. For an up close viewing the public can visit Audi Kiarong during opening hours. T.C.Y. 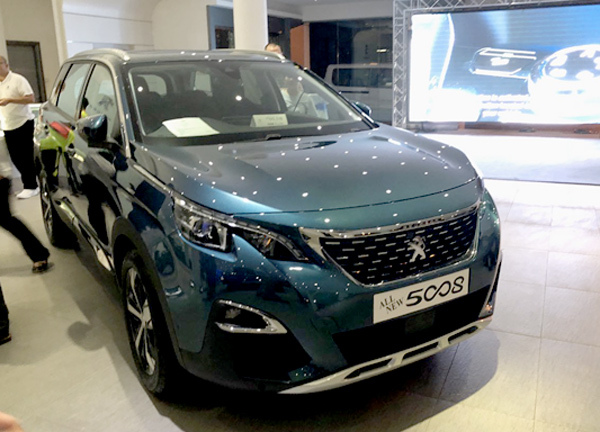 Motors, the sole distributor of Peugeot in Brunei held a media test drive of the all-new Peugeot 5008 SUV on February 8, 2018. A mini presentation of the all- new 5008’s new feature was also shown at T Lounge, located in Little Soho Building at Jalan Batu Bersurat. The all-new Peugeot 5008 which was newly launched SUV in Brunei of this year, currently has been awarded the “Best Large SUV” 2018 of UK’s leading car-buying website, What Car?. The main purpose of this event is to let the local media to have the experience first-hand of what the all-new Peugeot 5008 SUV has to give. And through this, Peugeot Brunei could easily convey to the public through the media’s own opinion about the new SUV. • to become the leading (benchmark) C-segment large seven-seater SUV. A rare colour to be seen in Brunei. The all-new PEUGEOT i-Cockpit® elevates the passenger compartment! Inside, the driver’s environment is unique with the newest version of the innovative, almost futuristic – PEUGEOT i-Cockpit®, which offers vehicle occupants a novel driving experience that both surprises and delights. With its compact steering wheel, a large 8” touchscreen dashboard and a spectacular 12.3” high-resolution digital head-up display, the new PEUGEOT i-Cockpit® impresses drivers with its superior graphics and elegant animations. PEUGEOT 5008 is more than just an SUV. • two removable, separate, folding seats in the third row. 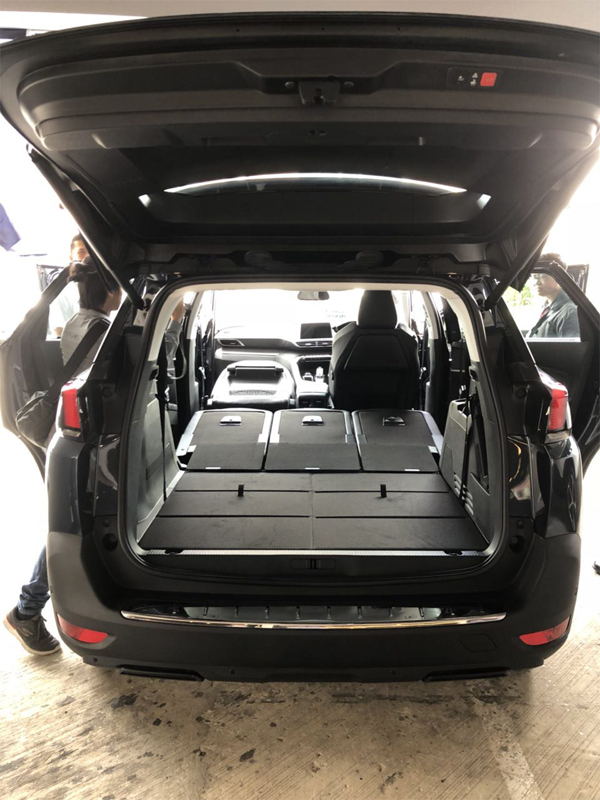 The all-new PEUGEOT 5008 SUV can also have foldable front passenger seat (to carry especially long loads up to 3.20 m) and a practical hands-free motorised tailgate. One look will recognise that the all-new PEUGEOT 5008 is a real SUV. All the hallmarks are there: long, horizontal bonnet; vertical face; and raised body line. The inspired design conveys power and respect. Its height remains the same. This gives it a long and dynamic profile. 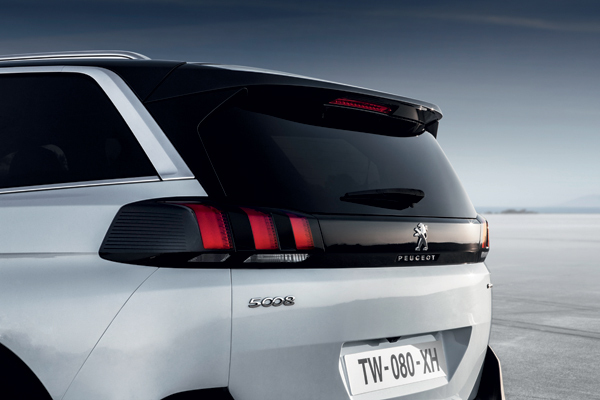 At the front, the wide grille with chrome fins is exclusive, while the rear design features the gloss black strip and the signature LED ‘claw effect’ rear lights that set the latest breed of PEUGEOT SUVs apart. This new PEUGEOT is an invitation to travel—in luxury, not least because it has excellent sound insulation and a number of features for the comfort of all on board: body-hugging front seats feature, large panoramic opening glass roof etc. It proposes also the best in permanent connectivity with the Mirror Screen function and navigation system. Cutting-edge Advanced Driver Assistance Systems make driving even safer with an arsenal of safety features Advanced Grip Control – including new exclusive Hill Assist Descent Control (HADC), Automatic Emergency Braking System (AEBS), Distance Alert, Active Lane Keeping Assistance (LKA), Driver attention warning, Smart Beam Assistance, Speed sign recognition and speed suggestion, Adaptive cruise control with stop feature (automatic gearbox), Active blind spot monitoring, Park Assist and Visio Park (360° vision). 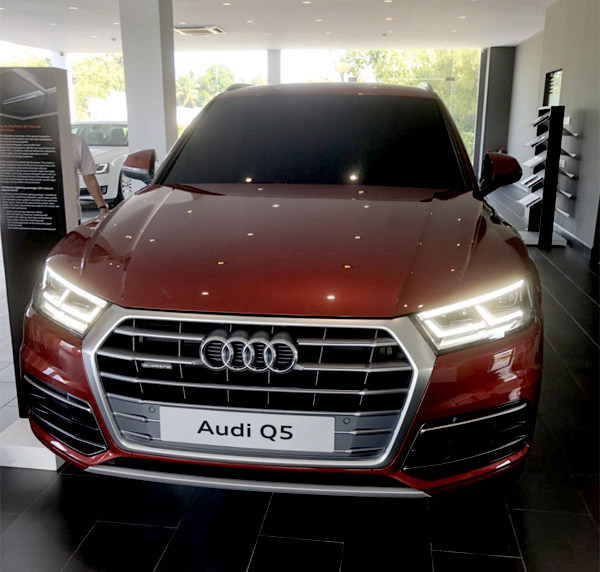 After a successful media preview last week, TCY Motors Sdn Bhd will organize a two-day launch for the 2018 Audi Q5 at its showroom in Kiarong. Taking place on Friday 2nd and Saturday 3rd February at Audi Kiarong, invited guests and the public can experience Audi’s most successful premium mid-sized XUV with a 3 stage product demonstration including a guided test-drive, driver’s assistance systems and B&O 3D sound experience. All test-drive participants will also enter a lucky draw to win a Bang & Olufsen BeoPlay A1 Bluetooth speaker. T.C.Y. 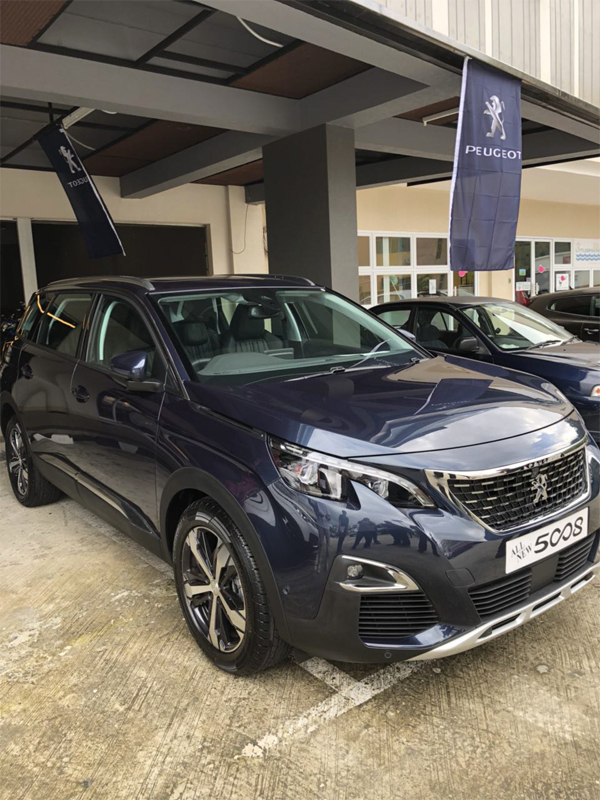 Motors, the sole distributor of Peugeot in Brunei proudly launched the All-New Peugeot 5008 SUV in the local market. 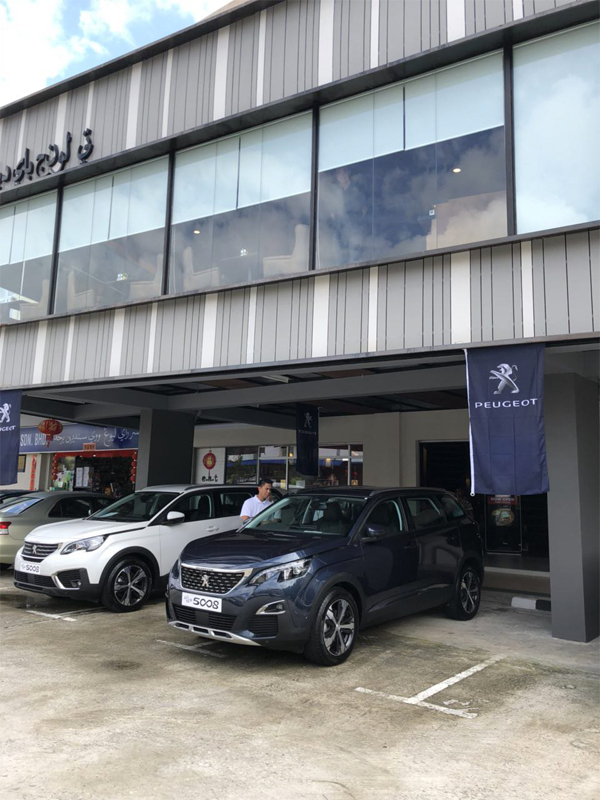 It was held at Peugeot Kiarong Showroom on January 26 to 27, 2018 last weekend. 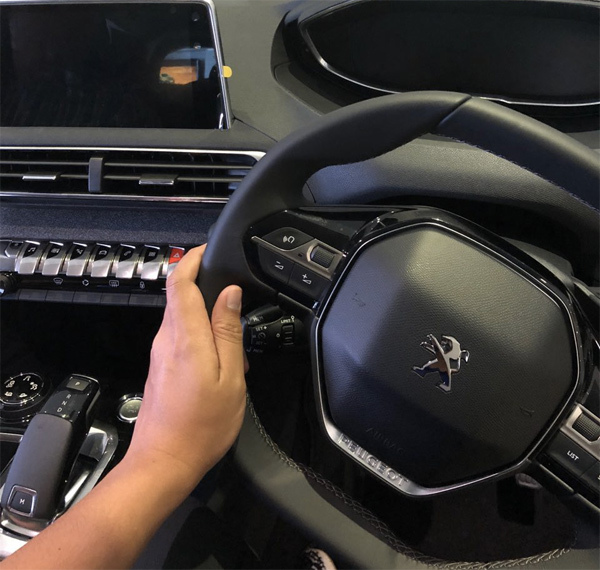 For an up-close and personal viewing of the All-New Peugeot 5008, Peugeot Brunei made the test-drive activity as the main focus during the launch. This new model will serve as another arsenal on Peugeot’s international SUV offense. Though its name hasn’t changed, the design is entirely unprecedented. The All-New PEUGEOT 5008 breaks new ground as a large seven-seater SUV in the C segment. As a new contender in this promising consumer market, it boasts many strengths. 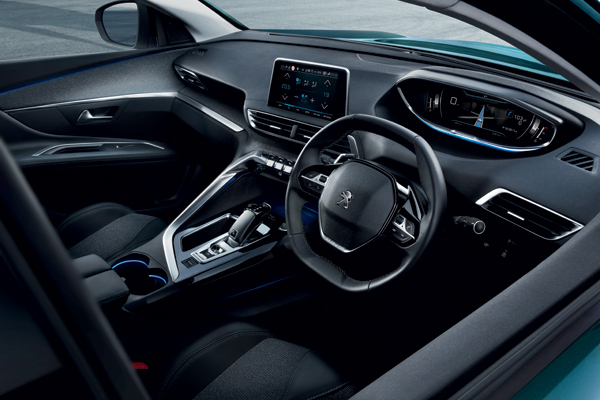 The All-New PEUGEOT 5008 SUV has not only have the new PEUGEOT i-Cockpit® system and the Efficient Modular Platform EMP2, but also a number of other high-tech features. Beneath its elegant and dynamic design you will find remarkable functionality: with its seven individual seats, the new PEUGEOT 5008 SUV is the first SUV with incredible modularity worthy of the best multi-purpose vehicles. The seats in the second row are entirely independent, but identical, adjustable and foldable. 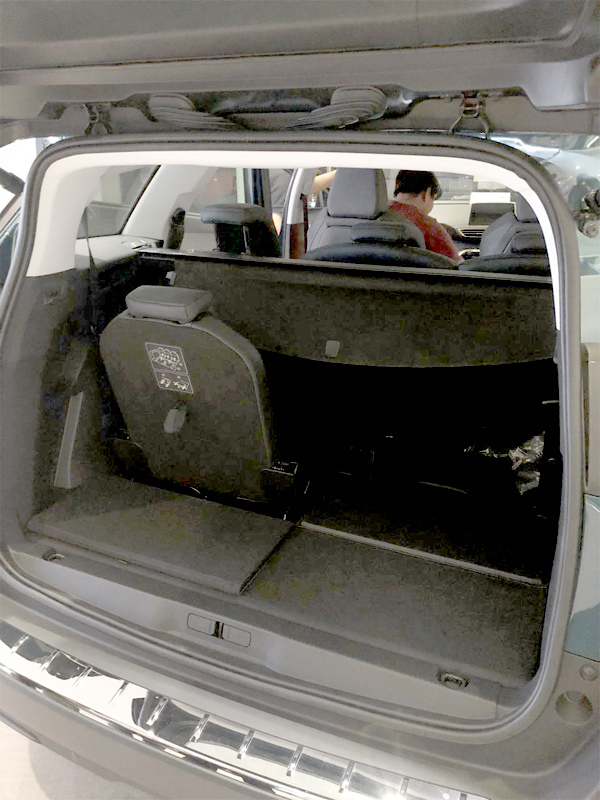 The seats in the third row are foldable and easy to remove to optimise a record 780 dm3 VDA 210 of space in the boot. 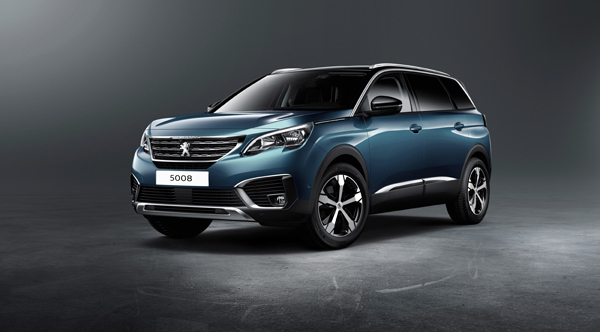 The All-New PEUGEOT 5008 produced in Rennes was first presented to the public in Paris, France before its international launch in the spring of 2017. Visitors can do experiments, with a technological and impactful demonstration of connected 3D navigation and the many driving assistance features available using the Samsung Gear VR virtual reality headset. A set of animations will be shown that will illustrate the Advanced Grip Control, Hill Assist Descent Control (HADC), Active Safety Brake, Distance Alert and the Active Lane Departure Warning features. All of the driving assistance features presented on the brand’s latest models constitute a new step towards achieving vehicle autonomy by 2020. PEUGEOT has continued its quest to make the driving experience more pleasurable by carefully studying the best way to design the driver’s cockpit. This quest resulted in an innovative interior layout: the PEUGEOT i-Cockpit®. It includes essential elements that make it easy to identify and highly desirable. -The steering wheel is even more compact. Redesigned with a rim with two flat parts for an improved grip, it provides more space for the driver’s legs and increases their field of vision. -The head-up display combination uses a 12.3” high-resolution digital screen with futuristic graphics. 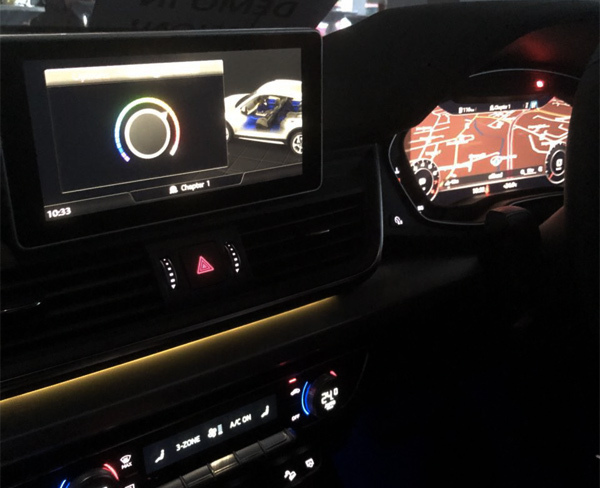 The display is entirely adjustable and customisable and it brings together everything the driver could want within their line of vision so that their eyes never leave the road and they can focus on driving. The aesthetics of each configuration rely on animations and modern, technological transitions. 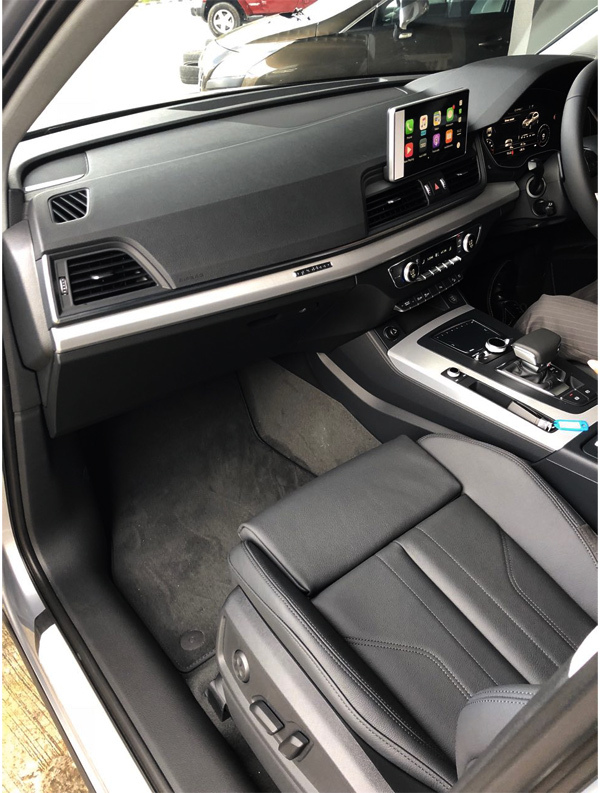 -The large 8” touch screen that brings together comfort controls in an intuitive way and makes it easy to use all the vehicle’s features. 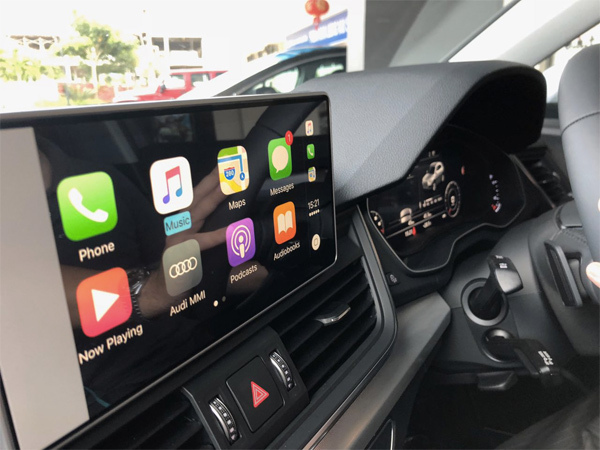 It is located in the centre of the dashboard and has powerful technology to make it more reactive and practical to use. This screen is complemented by a central console with an elaborate design. It boasts a series of high-quality chrome toggle switches that are metallic and soft to the touch. The vehicle offers passengers two sensory environments to begin with: Boost, for energetic driving, and Relax, for a calmer experience. Both of these modes are entirely customisable. 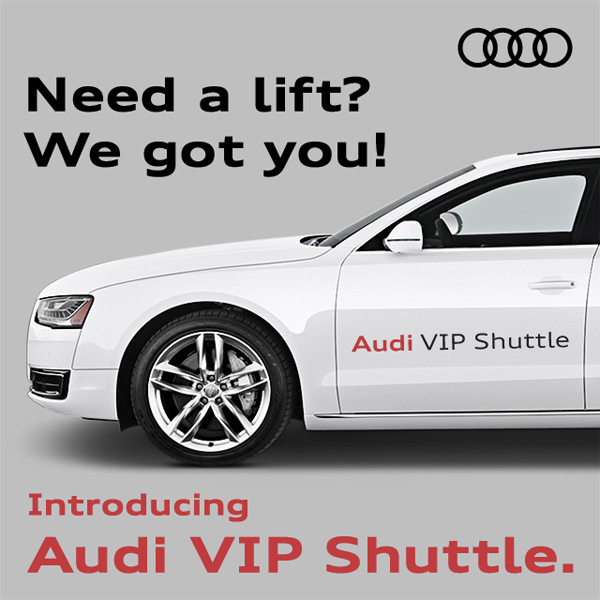 They create a unique and unforgettable on-board experience for driver and passengers alike. TCY Motors as the sole Audi dealer/importer today invited members of the press and media to a preview of the much awaited new second generation Audi Q5 premium SUV at Little Soho yesterday. I’ve been mentioning of the new Audi Q5 in my social media and previous postings on my blog and I’m pretty sure everyone’s anxious with the latest addition to the Audi family. Audi’s success story in the mid-sized SUV segment became its first model to sell over a million units in less than six years since its introduction in late 2008. It was Audi’s best selling model globally for 2013 and 2014. 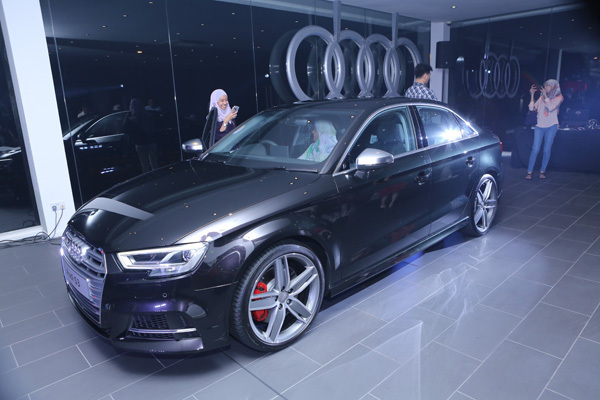 The global success also caught on in Brunei- it was the best selling Audi model locally from 2010 to 2014. 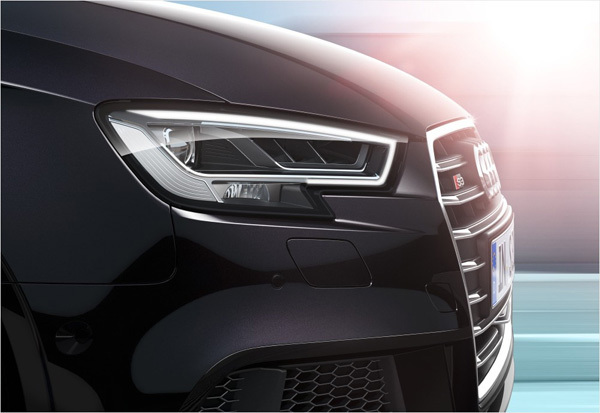 Defined by a clear Q DNA identity shared by its siblings, the emphasis is on power, strength and width of the new Q5. As with its predecessor the strengths of the new Q5 are in the fields of design, driving experience and everyday usability. 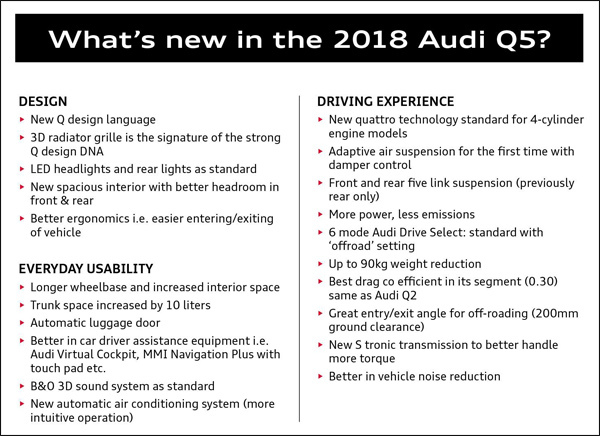 What’s new in the 2018 Audi Q5? – Better in car driver assistance equipment i.e. 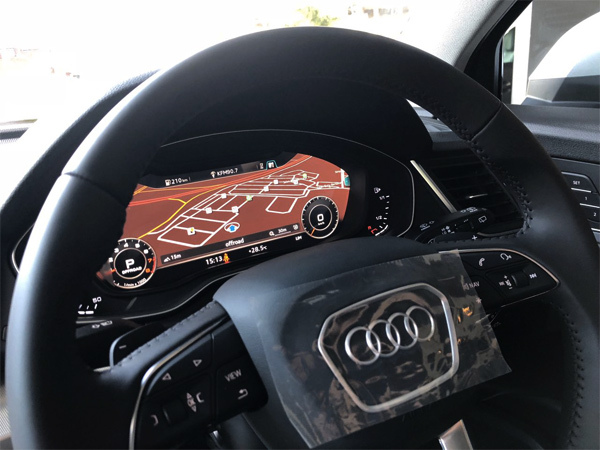 Audi Virtual Cockpit, MMI Navigation Plus with touch pad etc. 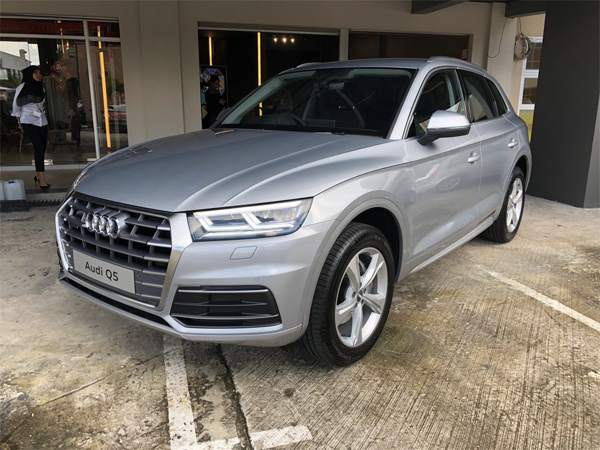 The new Audi Q5 2.0 TFSI quattro S tronic will be launched early next month at the Audi Kiarong showroom with a product experience and test-drive. 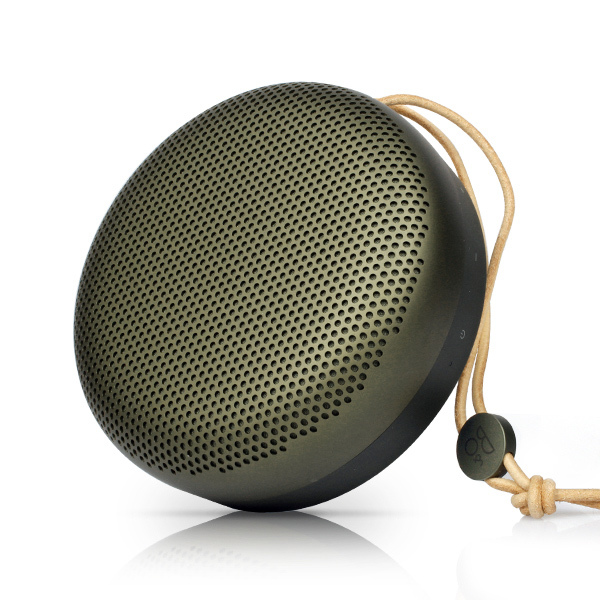 Test-drive participants will enter a lucky draw to win an exclusive Bang & Olufsen BeoPlay A1. The public is most welcomed to test drive and check out the new Q5. 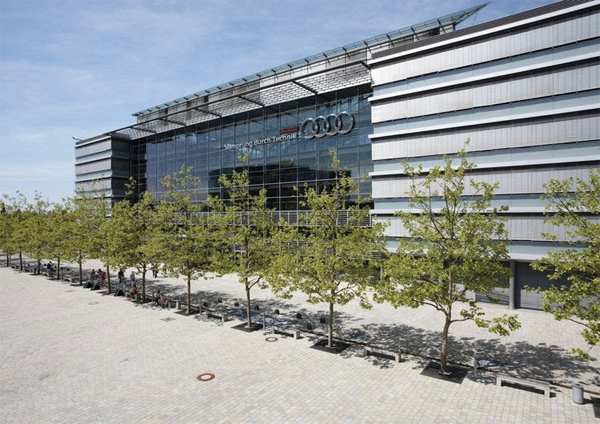 AUDI AG has increased its global sales for the eighth year in a row. Despite a turbulent first half of the year, the company achieved a new record-breaking figure: Around 1,878,100 deliveries represent an increase of 0.6 percent. 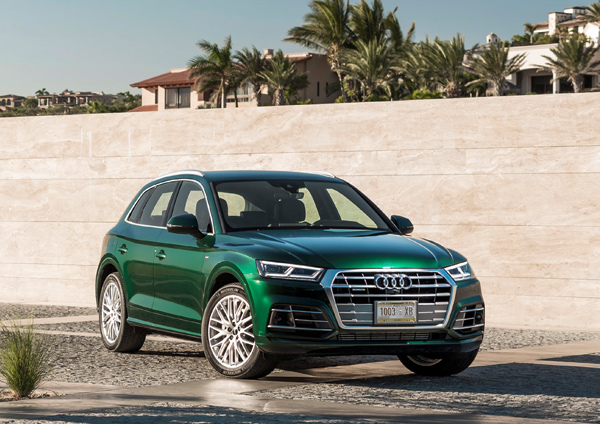 The Four Rings sold more than in the previous year in all three core markets in 2017: In the United States, Audi achieved new record-breaking sales month by month and closed the year 2017 with growth of 7.8 percent. In China, Audi not only managed to offset the poor delivery figures from the first half of the year, but even achieved a cumulative increase of 1.1 percent in the year-end spurt. In Germany, sales built on the very high level in 2016 with an increase of 0.4 percent. “Despite a very challenging situation we achieved positive growth in all core markets in 2017 and achieved a new record-breaking sales result worldwide. Every single market contributed to this outcome. This demonstrates the attractiveness of our product portfolio to our customers,” says Bram Schot, Board Member for Sales and Marketing at AUDI AG. Since June, Audi has managed to return to growth in China, steadily reducing the cumulative year-on-year decline month by month and ultimately achieving a positive sales balance. In the period January through December, the brand increased its deliveries by 1.1 percent to 597,866 automobiles. With this new all-time high, the company continues to maintain its lead in the Chinese premium market. Following on from its similar achievement in November, China also posted the highest volume growth of any individual market in the last month of 2017. Here the sales figures once again increased sharply, up 34.3 percent to 69,160 automobiles year-on-year. Never before had so many Chinese customers taken delivery of an Audi in a single month. Audi of America also achieved another successful year despite the declining overall market.Audi was the only premium manufacturer in the United States to grow steadily in 2017: up 7.8 percent to 226,511 units. In December 2017, the company also celebrated its 84th record-breaking month in a row (+16.3% to 26,977 units). With high growth throughout the year, Audi Canada (+17.9% to 36,007 cars) also established itself as a firm fixture among the top ten largest markets. Despite numerous political and economic uncertainties, sales in Europe rose 0.4 percent to around 860,600 cars. In addition to Germany (+0.4% to 294,544 cars), Italy (+10.5% to 68,954 cars) and France (+3.6% to 63,980) achieved new annual record-breaking figures. The market downturn in the UK had a negative impact on overall results: With 175,217 deliveries and a drop of 1.3 percent, total Audi sales in the United Kingdom, however, comfortably outperformed the declining overall market. The global increase in demand for the Q models (+10.8% to around 689,150 cars) was a major factor in the growth of the Four Rings in 2017. More than one out of every three Audi models sold was therefore an SUV. The best-selling Q model in Europe is the Q2. Apart from Germany (23,167 units), other major buyers here included the UK (12,636 units) and Italy (11,068 units). Global sales of the Audi Q3 once again increased in December (+11.3% to around 20,950 cars). In 2017, the most successful member of the Q family was the Audi Q5 with around 281,850 automobiles delivered. The most Audi Q5 models were delivered to the individual market China. The successor model will go on sale at Chinese dealers as a long-wheelbase version in spring 2018. The Audi Q7 also saw sales increase by 3.9 percent in 2017. Since the start of the year, sales of the full-size SUV have increased in North America alone by about a fifth to around 43,800 units.